It was thanks to The Cure that alternative rock music went commercial. Fronted by the aesthetically gloomy Robert Smith and consisting of a line up of gothic outliers, The Cure wasn’t the type of group to appeal to the mainstream, but during the ‘80s they were massive. The Cure had a Midas ability to generate uniquely odd songs that absolutely rocked Top 40 radio. The songs were eerie but drenched in infectious melody, which made the band one of the most successful British groups of all time. Interpol, The Smashing Pumpkins and Deftones all cite The Cure as primary influences, and it’s obvious that Denmark’s The Foreign Resort owes the same respect. 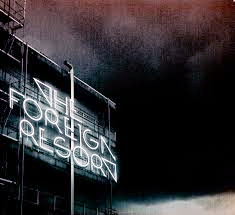 However, The Foreign Resort is so hung-up on immersing itself in the whole UK post-punk/ new wave sound that they’ve failed to acknowledge that a huge part of what made The Cure’s music so brilliant was Smith’s weirdly playful lyricisms. Furthermore, The Cure had legendary music videos, whereas these guys haven’t seemed to have bothered much. Love the sound, though.